Another Big Win For California Patients! The recent California Court of Appeal decision in People v. Baniani firmly establishes the right of patients to access medical cannabis through a collective or cooperative. 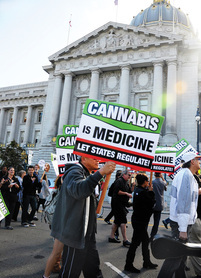 The Court stated what medical cannabis advocates have always known, state law protects members of a collective or cooperative who are qualified patients and are not engaged in a profit-making enterprise. The case is the culmination of over a decade of legal decisions and challenges by medical cannabis advocates. Americans for Safe Access won a similar victory after appealing the conviction of a medical cannabis provider in San Diego in 2012. In People v. Jackson, the court ruled that medical marijuana patients do not have to actively participate in the cultivation of medical cannabis, and that financial support provided by collective members through medical cannabis purchases constitute sufficient involvement in a collective. The Court of Appeal also declared that the state legislature passed laws that acknowledge the legality of retail medical cannabis outlets. In 2010, it enacted a 600ft distance requirement between cooperatives, collectives, dispensaries and schools. The Court reasoned that the legislature would not pass such a restriction if it did not intend for those facilities to exist. Further, the state legislature also specifically immunized collectives and cooperatives from the laws prohibiting the sale of marijuana. These enactments clearly envisioned legal medical cannabis sales. During his trial for illegal marijuana distribution, Baniani was not allowed to use the defense that he was operating a nonprofit collective. The Court of Appeal declared this to be a mistake and medical cannabis distributors will now be allowed to use the defense by presenting evidence to the judge that they were within the law. If the judge agrees that the evidence raises a doubt to the defendant’s guilt, the case will go to the jury to decide if any profit was made. Operators must therefore be sure to keep their books clean and accurate to avoid a conviction. The Court of Appeal’s decision affirms that the legislature’s intent by enacting the protections for nonprofit collectives and cooperatives was to fulfill the purpose of Prop 215 to provide for the safe and affordable distribution of marijuana to all patients in medical need. This case will hopefully stop police and prosecutors from interfering with the will of the voters as they have for nearly 20 years.